If you’re a keen gardener or still a beginner but raring to learn more, why not make the most of spring and take a gardening course in the beautiful grounds of Prangins Castle ? 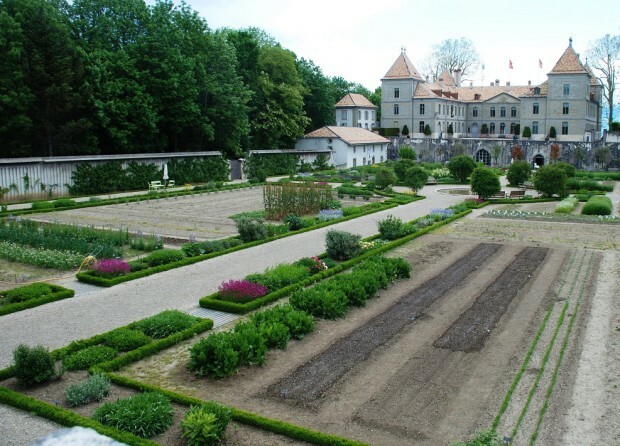 On the first Saturday of the month, starting from the 2nd of March until the 5th of October 2013 you’ll be able to learn about soil types, organic planting tecniques, heritage vegetables and caring for fruit trees with the glorious backdrop of one of Switzerland’s most beautiful castles. Courses are in French, so that’s another great bonus: practising a language while you do something you love is the best way to motivate yourself. I, for one, would much rather get my hands dirty and grow something delicious while chatting to people who share my love for all things verdant than sweat over endless pages of French verbs to learn by heart ! The “Cours Pratique Verger et Potager” is run by Bernard Messerli, Conservateur des jardins at the Château de Prangins in Canton Vaud. Lessons can be booked individually for 140CHF each or for the entire course (8 lessons for 800CHF in total, lunch not included). Courses start at 10am and finish at 5pm, places must be booked in advance at +41 (0)22 994 88 96. You can also take part in a guided tour of the gardens on Sunday 3rd of March 2013 from 10.30am to midday: “Le potager de mois en mois. Arbres et arbustes fruitiers: conduite et taille”. Bernard Messerli, conservateur des jardins, will give you some invaluable tips about caring for your fruit trees.